Abstract: Medical and biological research of the last 25 years has shown that lighting has, apart from a visual effect, also a non-visual biological effect on the human body. With the detection in 2002 of a novel photoreceptor cell in the eye, the biological effects that light has on human beings can be better understood. A large number of research projects that compare the effects on health and alertness as a result of people working under different lighting conditions have been carried out. We demonstrate that it can be beneficial, both from a wellbeing and productivity point of view, to have dynamic lighting in the work situation, in which both the level and the colour of the lighting vary in the course of the day. For more than 150 years, scientists considered rods and cones to be the only photoreceptor cells in the eye. Figure 1 shows the nerve connection between cones and rods in the retina of the eye and the brain from where the sensation of seeing originates. The sensitivity of the cone and rod systems varies with varying wavelength of light, and thus with varying colour of light. This is illustrated in Figure 2, where the red curve gives the spectral eye sensitivity curve (Vλ) for the cone system. As can be seen from this curve, the cone system and thus the visual system is not very sensitive to extreme blue and extreme red light, and has its maximum sensitivity for green-yellow light. Seen in an historical context, it is amazing that David Berson of the Brown University (USA) detected in 2002 a novel, third type of photoreceptor in the retina of mammals. This novel photoreceptor cell type regulates many non-visual biological effects such as circadian timing, body temperature, heart rate, cortisol production, melatonin production and alertness. The novel cells have their own nerve connections to the biological clock located in the brain (also called the suprachiasmatic nuclei, SCN). The biological clock in turn has a nerve connection with the pineal gland that is responsible for the regulation of some hormones. Figure 1 shows this nerve connection between the novel photoreceptor cells in the retina of the eye and these locations in the brain (blue curve). The sensitivity of this novel photoreceptor cell also varies for different colours of light. The spectral (colour) sensitivity curve is given in Figure 2 as a full drawn curve. By comparing the two curves it is immediately evident that the biological sensitivity for different colours of light is quite different from the visual sensitivity. Where the maximum visual sensitivity lies in the yellow-green wavelength region, the maximum biological sensitivity lies in the blue region of the spectrum. 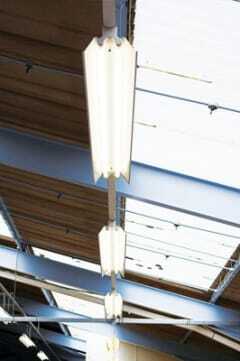 These phenomena are important for the specification of healthy lighting. It is now understood how light mediates and controls a large number of biochemical processes in the human body. The most important processes are related to the control of the biological clock and to the regulation of some hormones through regular 24 hour light-dark rhythms (day and night rhythms). Figure 3 illustrates some typical rhythms in human beings. The figure shows only a few examples: body temperature, and the hormones cortisol and melatonin. The hormones cortisol and melatonin play an important role in governing alertness and sleep. Cortisol, among other things, increases blood sugar to give the body energy. A popular expression for cortisol is therefore ‘energy hormone’. Cortisol levels increase in the morning and prepare the body for the coming day’s activity. They then decrease gradually but remain at a sufficiently high level to give enough energy over the course of the bright day, falling finally to a minimum at midnight. The hormone mealatonin slows down some bodily processes and therefore makes us sleepy. The popular expression therefore is ‘sleep hormone’. The level of the sleep hormone melatonin drops in the morning, reducing sleepiness. It normally rises again when it becomes dark, permitting healthy sleep (also because cortisol is then at its minimum level). In a natural setting, light, morning light synchronises the internal body clock to the earth’s 24 hour light-dark rotational cycle. Without the regular 24 hour light-dark cycle,the biological clock would be free-running. ‘Morning-type’ humans have a free-running time shorter than 24 hours, while ‘evening-type’ humans have a free-running time longer than 24 hours. The difference between an individual’s own free-running time and the 24 hour cycle produces ever greater day-to-day deviations in our body temperature, cortisol and melatonin levels from those set by the environmental clock time. This desynchronisation in the absence of the ‘normal’ light-dark rhythm would result in a wrong rhythm of alertness and sleepiness, ultimately leading to alertness during the dark hours and sleepiness during the bright hours. The same symptoms, and for the same reason, are in fact associated with jet lag after travelling over several time zones. Rotating shift workers also experience the same symptoms for a couple of days after each shift change, again for the same reason. In order to avoid healthy people working during daytime getting similar problems, it is essential that they can benefit from the 24 hour bright-dark rhythm. If daylight cannot take care of the bright part of the rhythm, for example because workers or school pupils are located at some distance from windows, suitable artificial lighting has to take over. A wealth of research projects that compare the effects on health, wellbeing and alertness of workers under different lighting conditions have been carried out. Here we will discuss only a limited number of typical cases. Küller and Wetterberg studied the brain-wave pattern (EEG) of persons in a laboratory that had been made to resemble an office environment, once with a relatively high lighting level (1700 lux) and once with a relatively low lighting level (450 lux)2. The composition of the EEGs exhibit a pronounced difference: the higher lighting level results in fewer delta waves (the delta activity of an EEG being an indicator of sleepiness), indicating that bright light has an alerting influence on the central nervous system (see Figure 4). We also learned that lighting during daytime hours can influence the sleep quality during the night. The relationship between the lighting level at the eye during day and sleep quality during night has been studied by Aries with 42 office workers3. The lighting situation at the work stations of these office workers, spread over ten different office buildings, was measured and the individual subjective sleep quality determined (by means of so-called Groninger Sleep Quality questionnaires). The results show a significant positive correlation between vertical illuminance during daytime and sleep quality during night. Figure 5 gives an indication of the relationship. From the above it is evident that the total visual environment has a direct connection with health. Different professions are involved in determining the visual environment. Architects determine the daylight penetration possibilities by the orientation of the building and the design and shape of windows. Interior designers determine the reflection and absorption of both day and artificial light by the colours of ceiling, walls and furniture. The lighting designer determines the link between day and artificial light and the quality of the artificial lighting. Here we will focus on the relevance for the lighting designer. The non-visual biological effect of light is not directly governed by the illuminance on the working plane, but by light entering the eye. It is evident that it is not sufficient for ‘healthy’ lighting installations to specify only the illuminance on the working plane. The consequence of working during daytime indoors, is 40 to 200 times less light compared to being outdoors. Many studies, some of which we dealt with in the previous section, indicate that lighting levels of at least 1,500 lux on the eye are needed for biological stimulation. In most offices and industrial areas this lighting level is not available from daylight entering the premises for those not working close to windows and in winter time, for all, during the morning hours. In these situations artificial lighting should take care of the extra lighting required. By using blue-white light colours at the moments when biological stimulation is wanted, this required lighting level can be somewhat lower than 1,000 lux because of the high blue sensitivity of the novel photocell. In a working environment, both action and relaxation are necessary. The changing colour and lighting level of dynamic artificial lighting can help to create these conditions. Figure 6 gives an example of a lighting scenario where both the level and colour of light gradually vary according to the ‘human rhythm’. In the morning, the scenario starts with stimulating, cool-white light of relatively high level that gradually turns into warmer white and a lower level. Around lunchtime, the minimum level needed for visual activities is provided (500 lux), but in a warm-white colour so that the body can benefit from a biologically relaxing period. This also facilitates a beneficial powernap4. After lunch, a sharp rise in level and a change to cool-white light is provided to re-activate the body. During the afternoon the lighting level decreases again while the colour gradually changes to warm-white. Such a ‘human’ rhythm has a positive effect on wellbeing, sleep quality and alertness and this in turn should have extra positive effects on productivity. At the beginning of the industrial revolution, most people moved away from an outdoor daytime environment to an indoor daytime environment. The consequence of this was 40 to 200 times less light for those not working very close to a window. We have now learned that this has a negative influence on health and wellbeing. Thanks to the recent discovery of a novel photoreceptor in the eye, however, and the understanding of the mechanism responsible for non-visual biological effects, we are now able to define lighting situations that ensure that healthy people remain healthy. We do this by ensuring that they receive sufficient biologically active light at the moments when this is needed. Lighting - daylight as well as artificial light - that is dynamic in both level and colour is the key in this respect. Using cool white light at moments that biologically active lighting is required is important, because it lowers the lighting level required and thus enables saving on energy costs. 1 Brainard, G.C., 2002. Photoreception for regulation of melatonin and the circadian system in humans. Fifth International LRO lighting research symposium, Orlando. 2 Küller, R., Wetterberg, L., 1993. Melatonin, cortisol, EEG, ECG and subjective comfort in healthy humans: impact of two fluorescent lamp types at two light intensities. Lighting Research and Technology. 25, 71-81. 3 Aries, M., 2005b. Human lighting demands, healthy lighting in an office environment. Public presentation of thesis, University of Technology, Eindhoven, The Netherlands. 4 Mednick,S.C., Ehrman, M., 2006, Take a nap! Change your life. Workman Publishing Company, New York. 5 Van Bommel, W.J.M. , 2006. Dynamic Lighting at work- both in level and colour. CIE Publication x031:2006, 62-67. Proceedings 2nd CIE expert symposium “Lighting and Health”, Ottawa.